Bruce Davis is a social entrepreneur. He is a native of Long Island, New York is a father of 4 and devoted husband to his lovely wife, Tiana Davis. They met as children over 20 years ago in their hometown of Hempstead, New York and have continuously worked together to fulfill the purpose that God has set before them. In addition to being a family man, he is also the quintessential business man. Among the many endeavors that Bruce has embarked on, he began his career as a chef and formerly owned Jadé Soul Food Restaurant in New York. 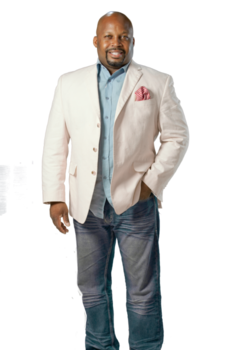 In addition to being a chef, he is also a phenomenal Author, a Publisher and a Ministry Marketing Consultant. In describing himself you will hear him say, "Cooking gives me an opportunity to break bread with family and friends and writing gives me an outlet to express my most passionate views." ​Understanding the Kingdom view of Marketplace Ministry allows him to successfully connect business, ministry and purpose. One of his most recent works, "Your Book Is Your Seed", addresses the struggles of many authors in their attempts to get published and the continued efforts required in marketing their books. His love for literature and socializing combined, has spawned, Around HIM Publishing. A marketing company set out to assist aspiring authors in socializing their way to the "Best Sellers List" and teaching them that the first step in reaching an audience is in knowing that "Inspired people, Inspire People"! What element of a book is the most important? Seventy-five percent of 300 booksellers surveyed identified the look and design of the book cover as the most important component. They agreed that the jacket is prime real estate for promoting a book.